I think it will be advisable to have General Gregg make a pretty strong reconnaissance to-morrow well down the [Weldon] railroad to ascertain if any movement toward our rear is in contemplation. I feel pretty confident an effort will be made at some point Monday night or Tuesday [November 7 or 8, 1864]. Meade, responding to Grant’s instructions, had his chief of staff Andrew A. Humphreys send General Gregg a message instructing him to “make a strong reconnaissance to-morrow [November 7] well down in the direction of the Weldon railroad, to ascertain if any movement toward our rear is going on or about being made…” Humphreys was a bit vague in his orders concerning the timing of the operation, so Gregg asked for clarification. He preferred to wait until around noon of November 7, figuring that way any potential Confederate operation would be well underway. Meade didn’t see it that way, pointing out that he wanted Gregg to head a good distance down the Weldon Railroad, perhaps even past Rowanty Creek. Gregg accordingly prepared his cavalry division to move out on the morning of November 7, 1864 to see if Lee had any plans to break up the election on the Union army’s left and rear. It will be well for you to push cavalry out to-morrow as far toward the Chickahominy as they can go and as near to the enemy. It is possible there will be an effort made to-morrow night or Tuesday by the enemy. They will not venture on a direct attack, but may attempt to get in your rear with a small force. Terry made preparations to carry out Grant’s orders, and took other precautions as well. On the morning of November 7, 1864, General Gregg had his cavalry division, 2,400 strong, move down the Weldon Railroad on the expedition Grant had ordered the day prior. The Third Brigade started from Gary’s Church before moving directly to Ream’s Station and then down the Weldon Railroad, looking for any Confederate columns moving from the direction of Rowanty Creek. 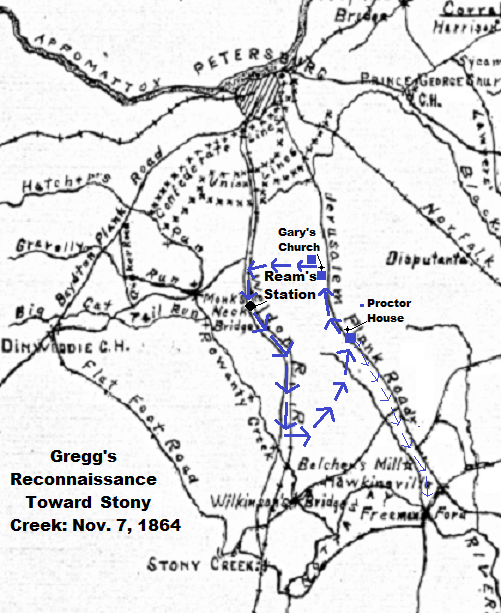 Gregg accompanied the Second Brigade from “below Gary’s Church” to a road east of Ream’s Station, eventually hitting the railroad four miles south of the station, and rendezvousing with the Third Brigade. This combined force of 1,600 men moved to a point fully six miles south of Ream’s Station, sending scouts another two miles south for good measure. At that point, Gregg took his brigades east to the Proctor House on the Jerusalem Plank Road, where he met the 800 troopers of his Frist Brigade. One of its regiments had been sent to scout in the direction of Freeman’s Bridge on the Nottoway River. The reunited division then moved back north, having engaged in no real skirmishing and losing not a single man. They did kill one Confederate and captured 9 more, but these men were scouts rather than pickets shielding a larger force. Gregg dutifully reported back that his expedition found the Confederate cavalry picketing south of the Rowanty and no enemy forces on the move. If Lee was going to disrupt Union voting the next day, it wouldn’t come from this direction. After Grant instructed Terry to send cavalry to the Chickahominy on November 7, Terry replied that he had already pushed pickets further out than ever before, fearing the same attack Grant expected. Colonel Robert West of the First Brigade commanded Kautz’s cavalry division temporarily at this time. Terry instructed him to send Spear’s Second Brigade to the Chickahominy prior to daylight, keeping an eye on any possible activity on the Charles City Road and Long Bridge Road in the process, and terminating at White Oak bridge. A second brigade would relieve Spear at noon, and the two brigades would alternate in these scouts until Grant ordered them to stand down. Before West could get started, however, a force of Confederate infantry, estimated at about 200 strong, attacked Unon avalry pickets at Fussell’s Mill, site of major combat during the Second Deep Bottom Campaign, just after midnight on November 7. Spear, who was supposed to get underway just before daylight, headed out to meet this threat immediately. By mid-day on the 7th, Terry reported to Grant that his cavalry were well out to the right and right rear, with nothing to report yet. In addition, the Official Records correspondence from November 7, 1864 is full of messages back and forth between Terry and various subordinates, all with the goal of protecting against and potentially responding to a possible attack on the far right.